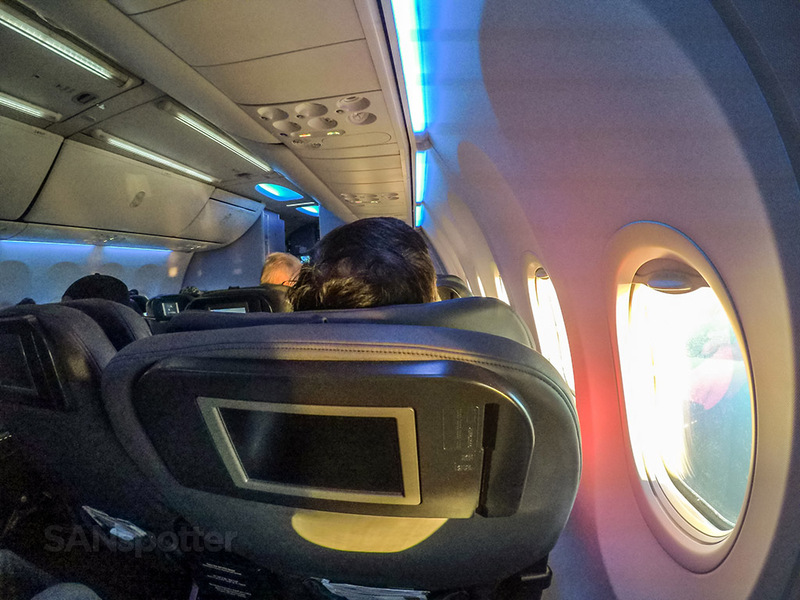 United Airlines 737-900/ER first class San Diego to Los Angeles – so much better than a regional jet! Does anyone happen to know where I can get one of those fancy alarm clocks that Tom Cruise had in the movie “Vanilla Sky”? You know, the one with the soothing voice of Penelope Cruz gently whispering “open your eyes…open your eyes…” over and over? I think I need one of those. It sure would be a heck of a lot better than the sound of my current alarm clock, which instinctively makes me want to throw it through the window before the first beep is even complete. Especially when it jolts me awake at 3:45 AM like it did this particular morning. 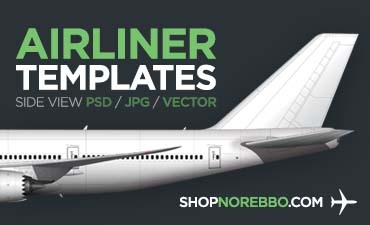 United Airlines 737-900/ER (N73445) side view illustration by norebbo.com. Seat map of this United Airlines 737-900/ER (courtesy of seatguru.com) showing my seat (4F) for this flight to LAX. Believe it or not, I somehow managed to get myself together and into an Uber headed for the airport by 4:15. 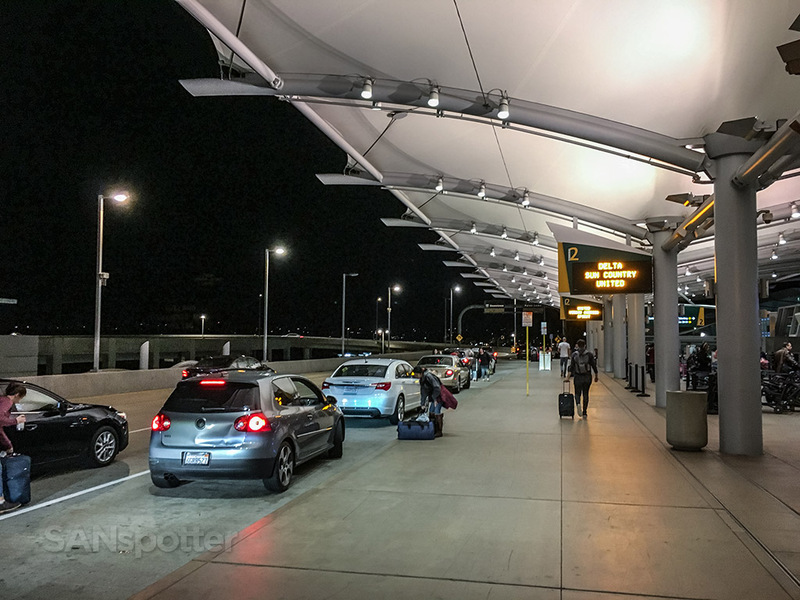 Traffic going down Interstate 5 at that ungodly early hour is minimal, so I found myself curbside at terminal two a short 15 minutes later. 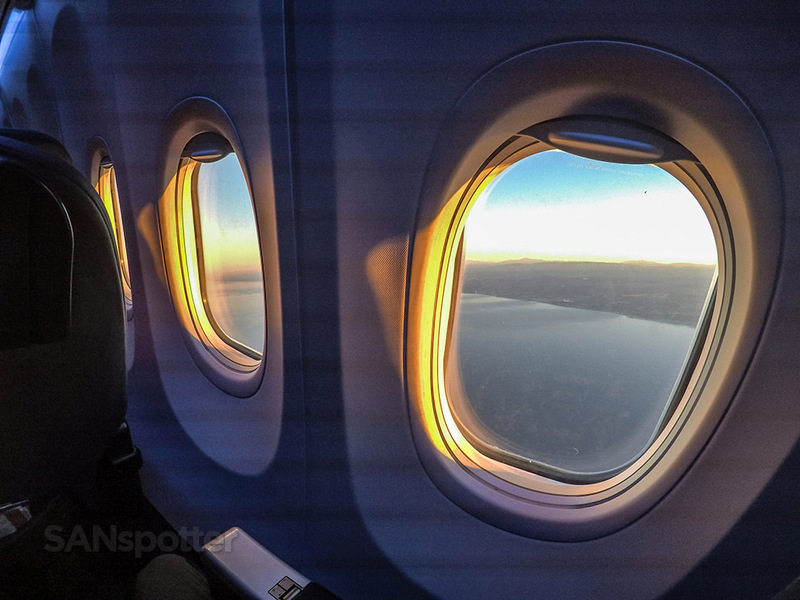 I guess that’s one really good thing about waking up so early to catch an morning flight – traffic is never a problem. Unless you get unlucky trying to cross the railroad tracks just north of SAN and there’s a long freight train crawling through. Those of you from San Diego who have been stuck on the wrong side of one of these trains knows exactly what I’m talking about. Thankfully there wasn’t a freight train in sight and it was clear sailing all the way to the airport. Didn’t I just end my last trip report form this exact same spot? This looks awfully familiar. 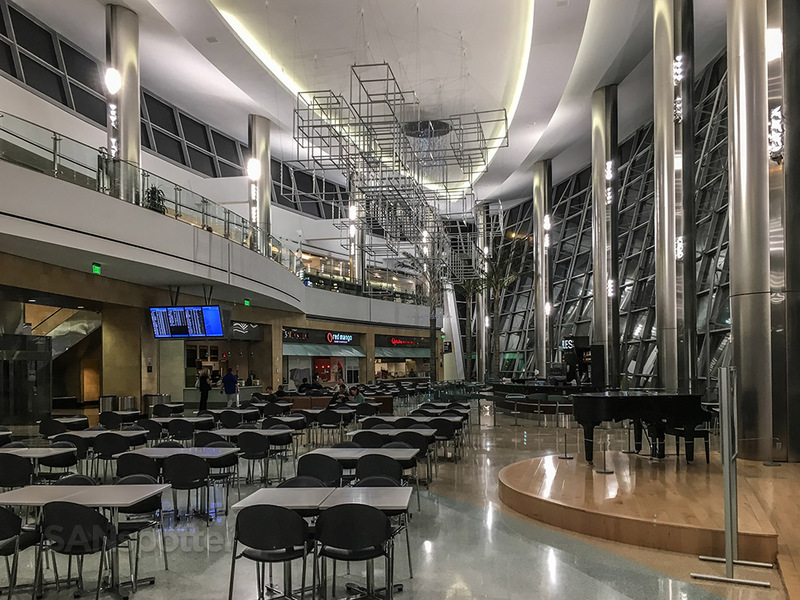 In we go to what I consider to be one of the best airport terminals in the US right now. 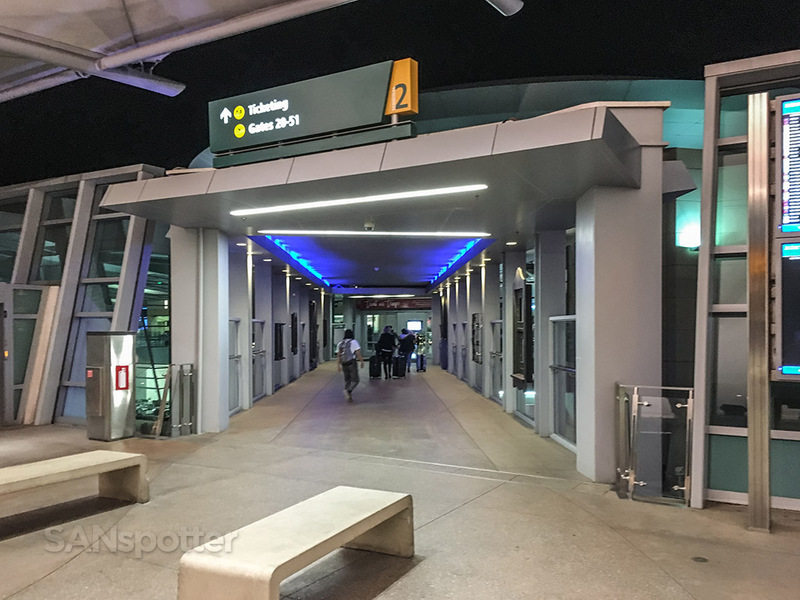 The security checkpoint is usually quite thin at that early hour as well. Maybe it’s because everybody else who has an early flight is a lot smarter than I am and they don’t even bother showing up until 30 minutes before departure time. I know that I could sleep a little bit longer before these early-morning flights, but that would cut into my precious Camden Food Company bonding time. Yes ladies and gentlemen, even at 5 AM I’m hungry for a Healthwhich. The horror! 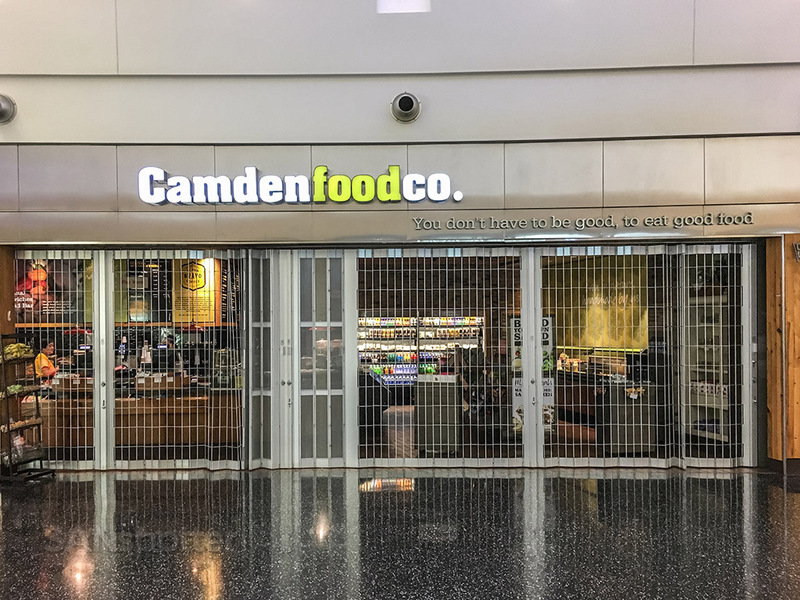 Camden Food Company doesn’t open for another 20 minutes! A quick check of the food court revealed that there weren’t any other restaurants open at this early hour either. Perhaps I’m the only weirdo craving breakfast at 4:40am? 5:08am, with a hot breakfast from Camden Food Company in hand. Mission accomplished. 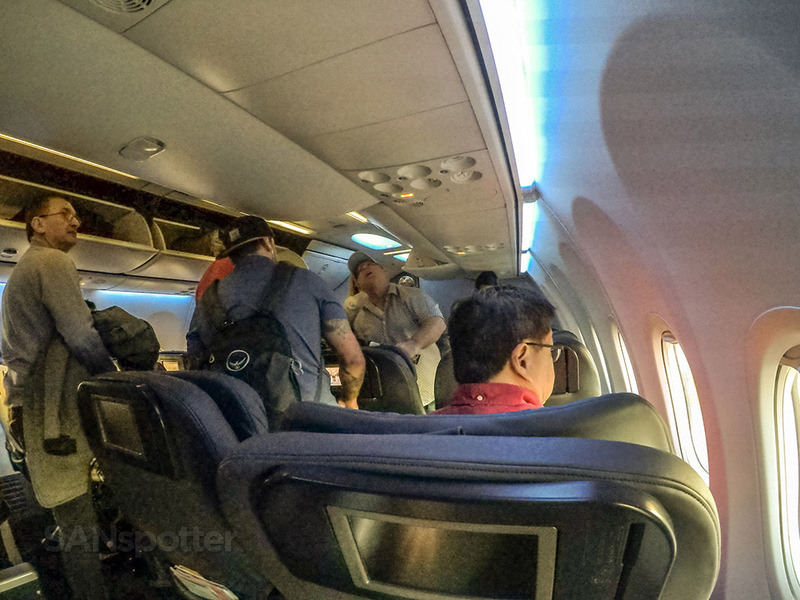 Domestic first class isn’t much to rave about, but I think the thing that I like the most about it is walking into a very crowded gate area where it’s standing room only, and pushing past everybody to take a spot in the priority / first class line. 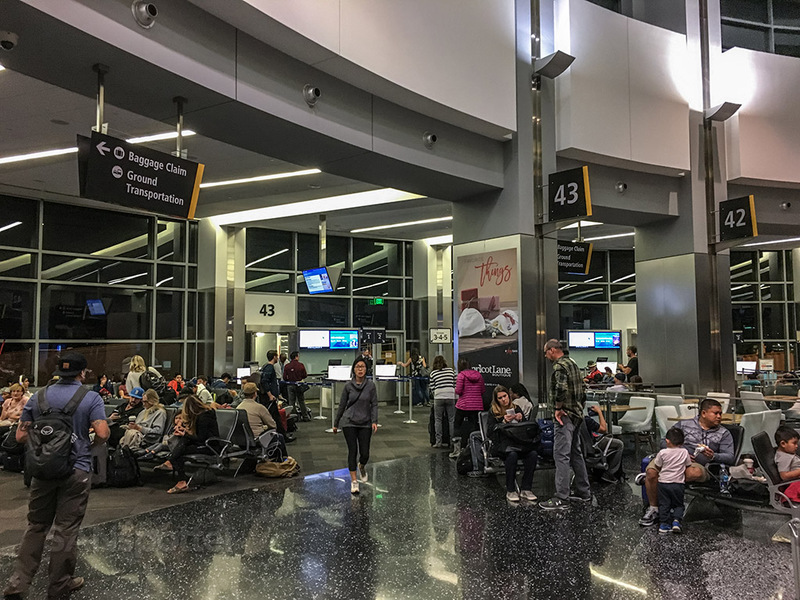 The gate area for this particular flight up to Los Angeles was as crowded as I’ve ever seen it, but I was easily able to snag the number two spot in line just a few minutes before boarding commenced. 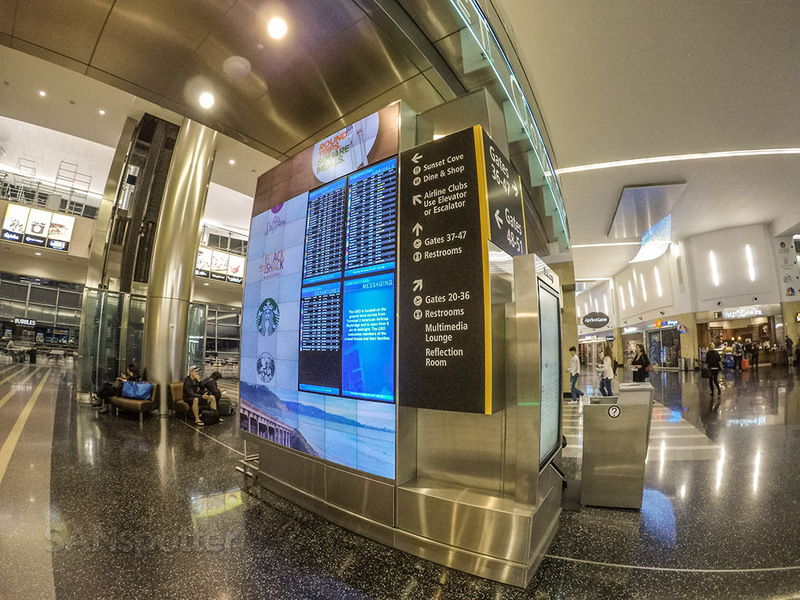 I wasn’t kidding when I said that this is one of the nicest terminals in the US right now. I’m totally biased, I know, but I love this place! 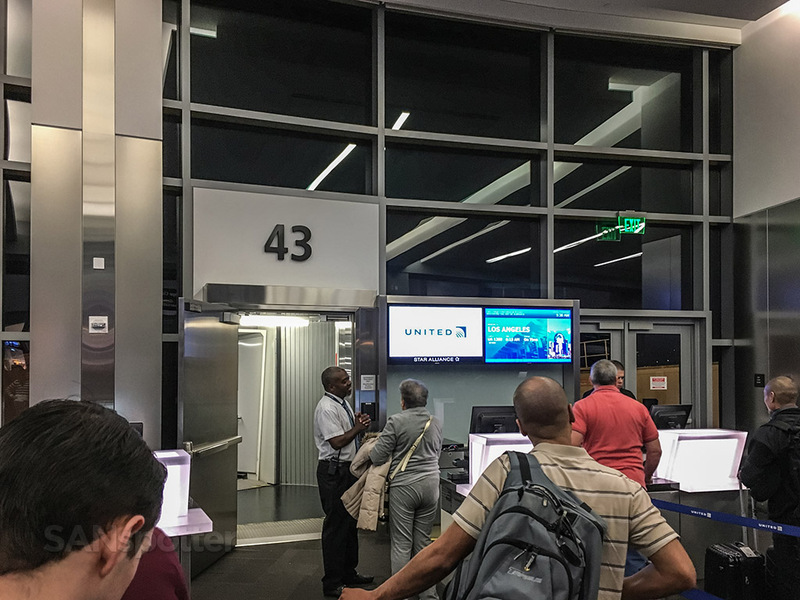 Standing room only here at gate 43 this morning. It’s official now…another trip has begun! 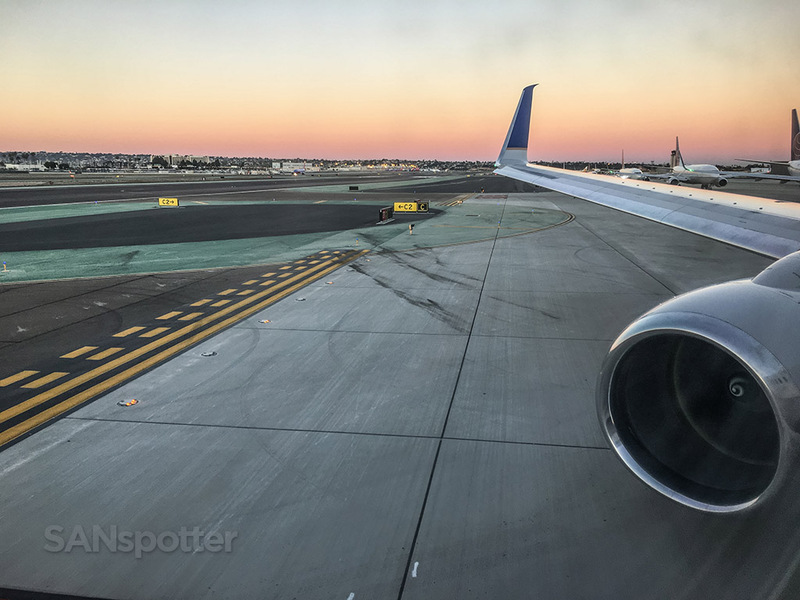 It’s nice flying a mainline aircraft up to LAX, but the downside is that it takes longer to board than it does to fly. 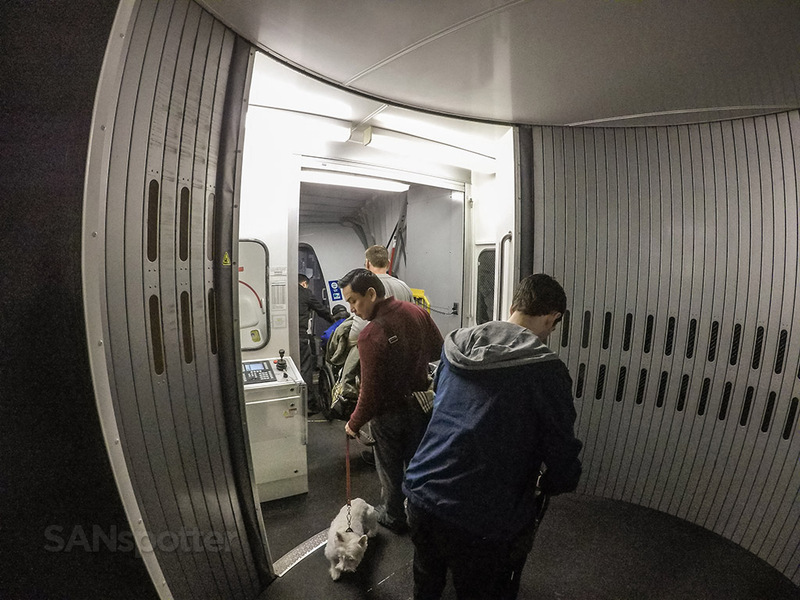 On a side note, that dog looks as if he’s saying “nope, screw this…” Either that or he’s looking for a nice spot to poo right here in the jet bridge. 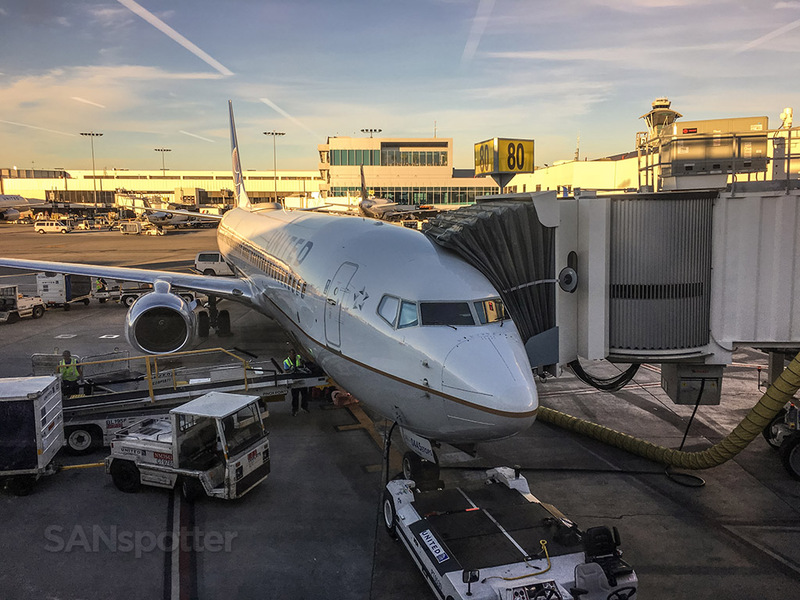 I still think it’s kind of interesting that United is using such a large airplane on the San Diego to Los Angeles route, but it makes total sense and I’m really glad they’re not using smaller regional jets as much anymore. United Airlines shuffles a ton of people between Los Angeles and San Diego every day, so having a proper first class product on this flight (even though it’s so short) is very nice to see. 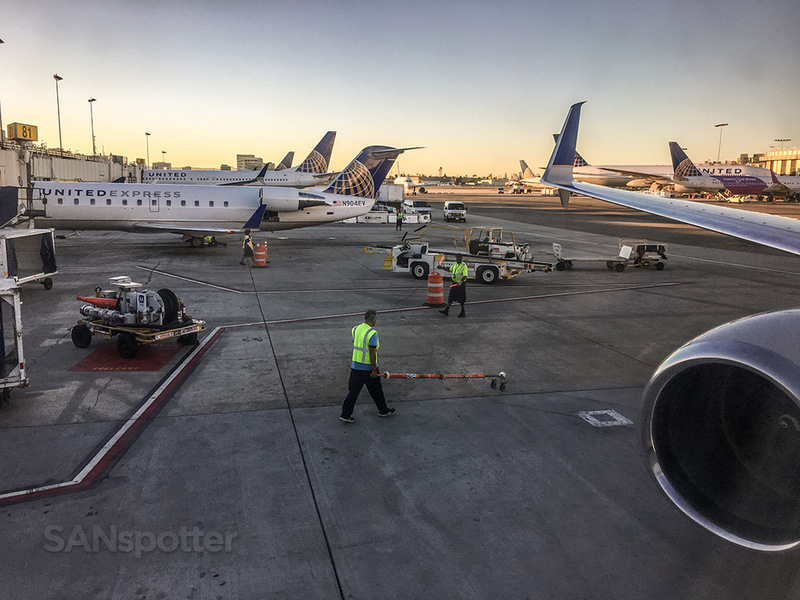 This isn’t the first time that I’ve taken a 737–900/ER up to Los Angeles from San Diego. 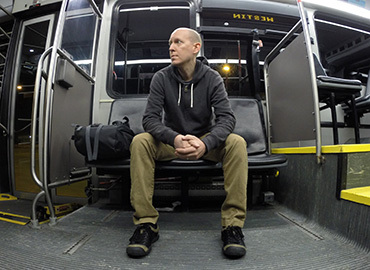 The last time I did it I had the misfortune of sitting in row five – which lacks windows. I learned from that mistake, and chose a seat in row 4 for this flight. 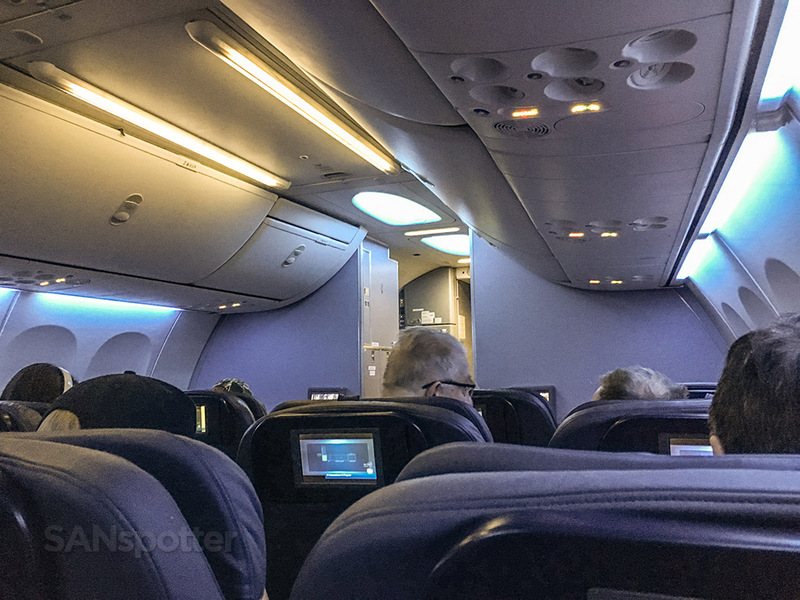 United Airlines 737-900/ER first class cabin. 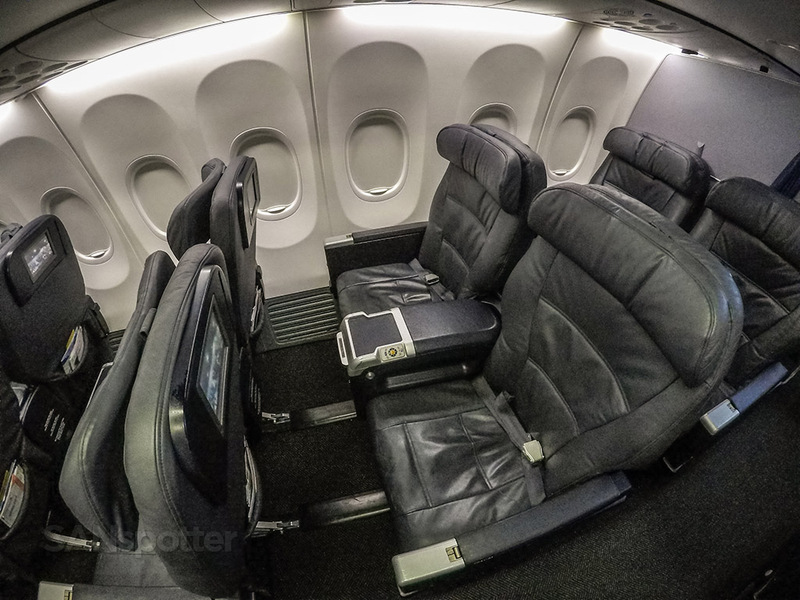 United Airlines 737-900/ER first class seats. 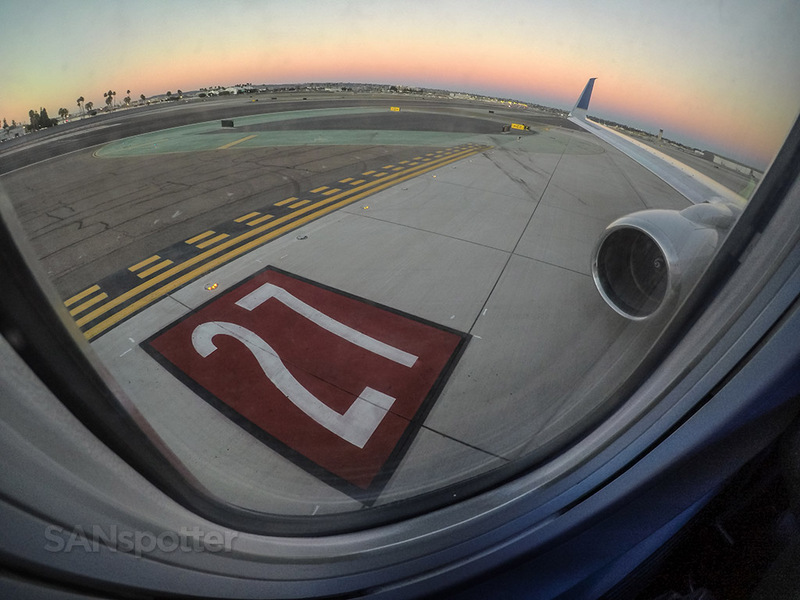 Not all that much to complain about – especially for such a short hop up to LAX! A center console so wide it’d be right at home in an Escalade. The materials may not quite be up to that standard however. 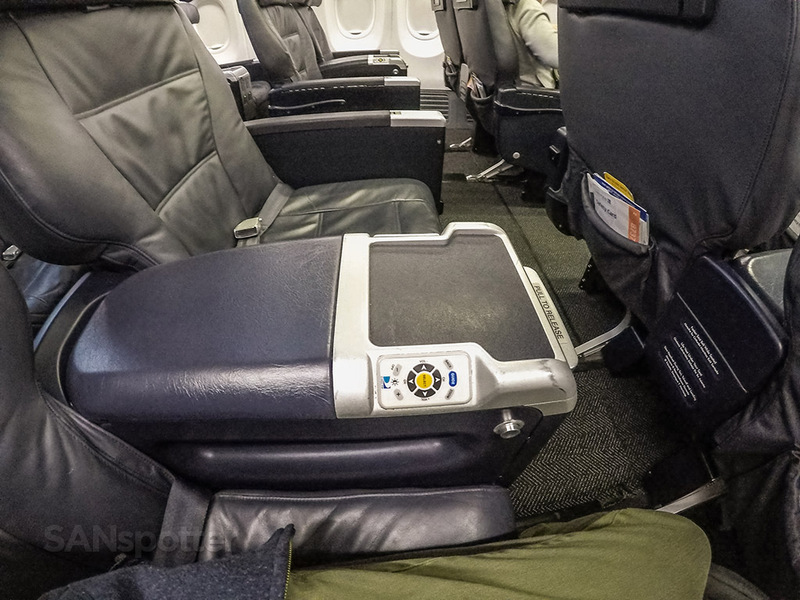 Pretty much the standard amount of leg room in any domestic US first class product. Yay! 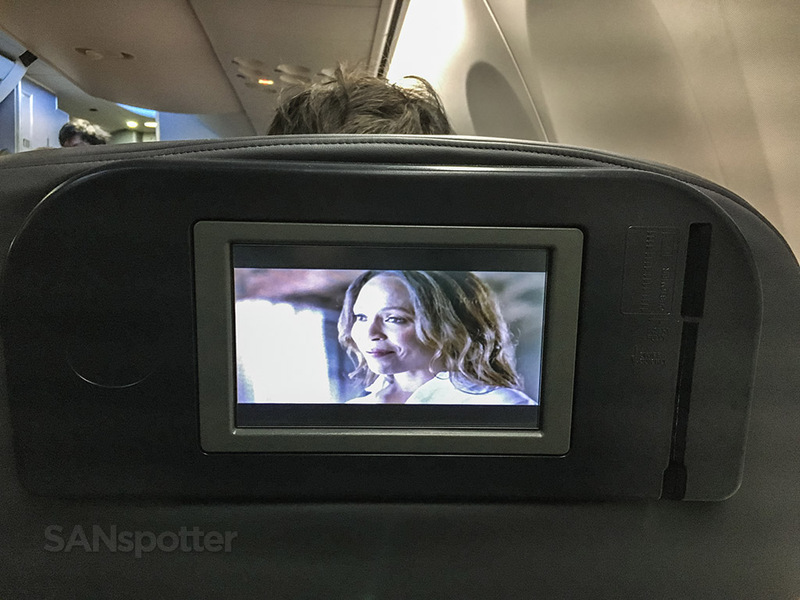 I love advertisements playing during boarding that you can’t turn off! United, please stop this insanity. 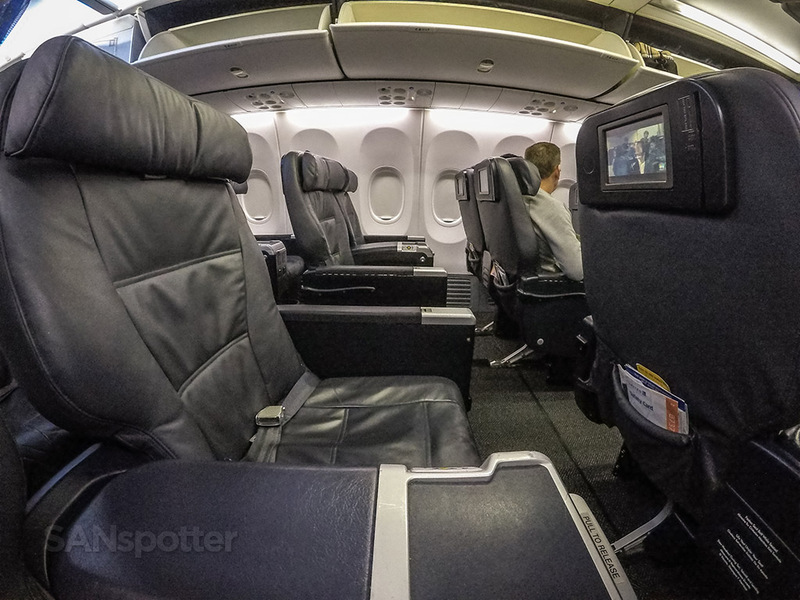 I’ve heard a lot of complaints about the dark seating materials, but I don’t see the problem (other than starting to wonder if I have a dark personality). 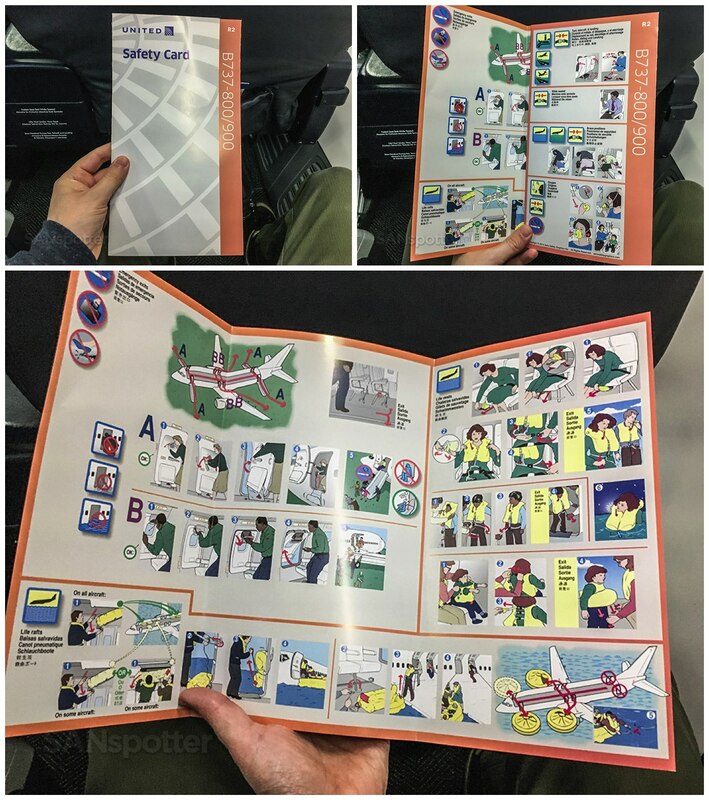 United Airlines 737-900/ER safety card. Way too early to digest any of it, but I had a look anyway. 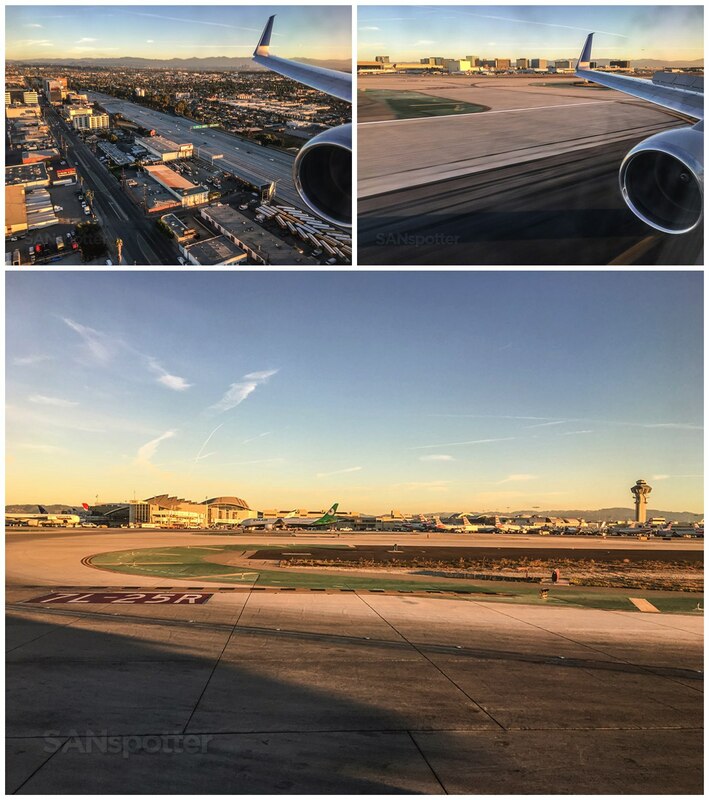 Just before pushback, the Captain mentioned in his welcome announcement that there was a chance that we would be arriving at LAX on runway 7R due to the strong Santa Ana winds coming from the east. 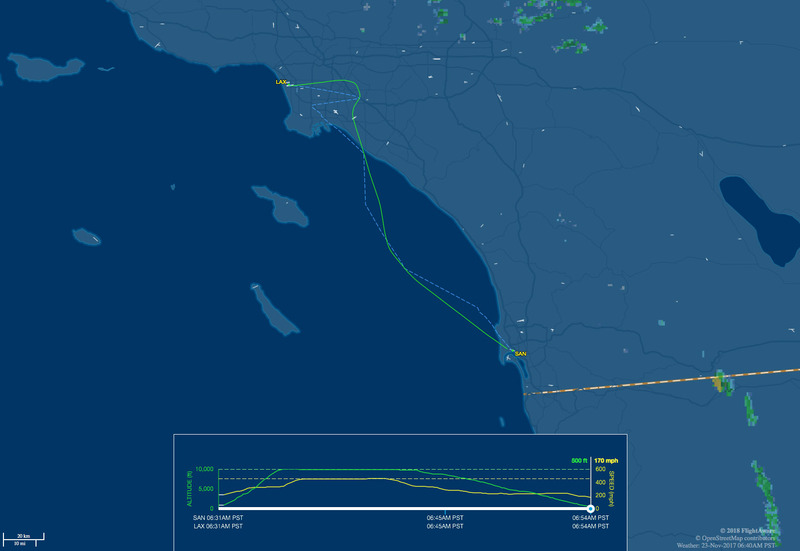 My eyes and ears perked up at that point, since I’ve never landed the opposite direction like that at LAX before. I’d wager to bet that I was probably the only person on the entire flight who was excited to hear that, but I was very much looking forward to getting pics and video of the reverse-ops experience. In motion, rolling right past Alaska Airlines territory. 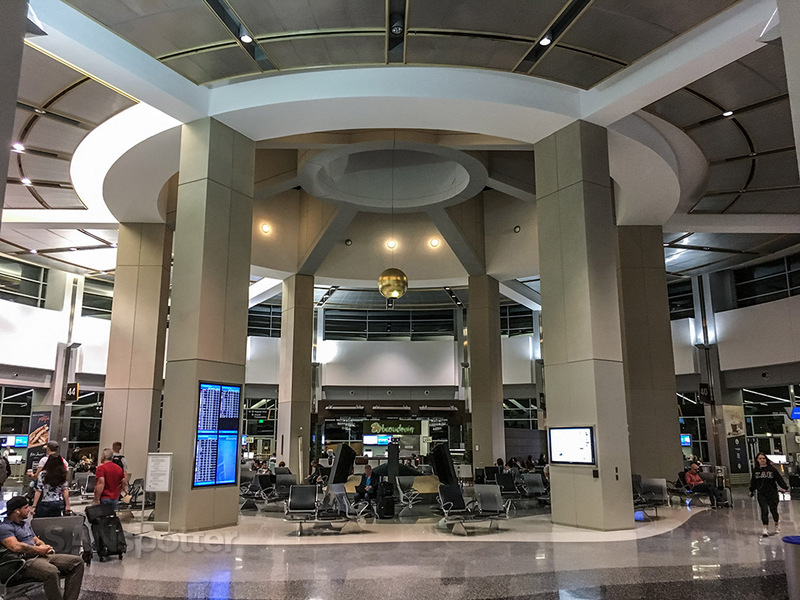 Rumor has it they will be moving to terminal 2 this year, and if that happens, you can expect a whole heck of a lot more AS trip reports on this blog. 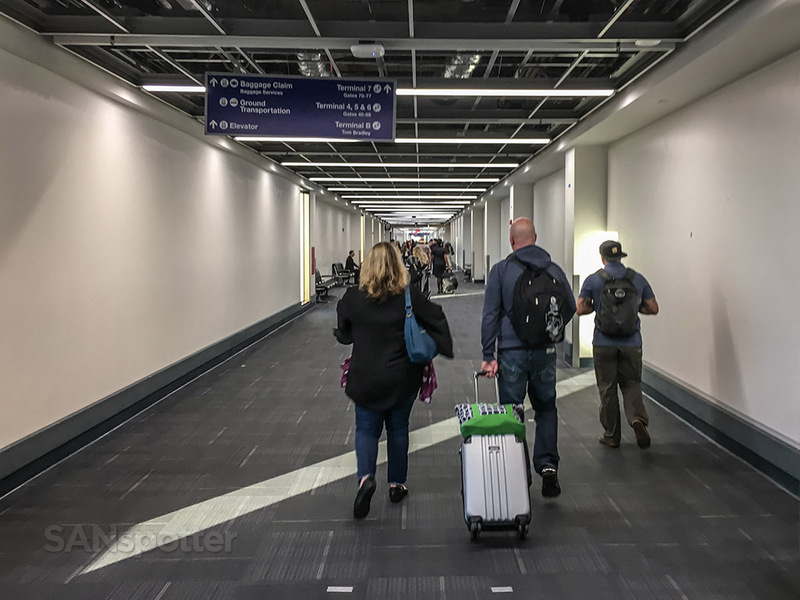 I hate terminal 1, but I really like Alaska Airlines! Well, would you look at that. Mood lighting! 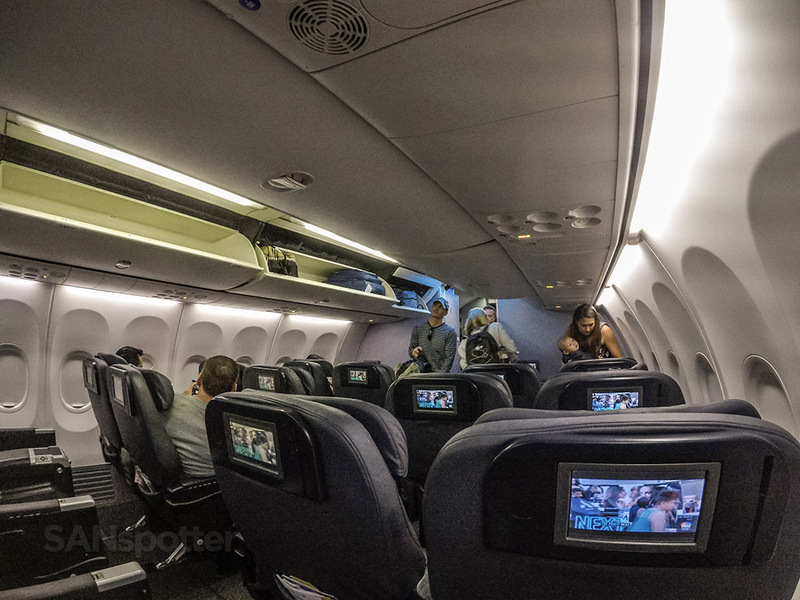 I had no idea UA had it installed on these 739’s. Crossing the runway to continue our taxi on the north side. We may be one of the first in line to depart this morning, but they won’t let us go until the 6:30am curfew is lifted. 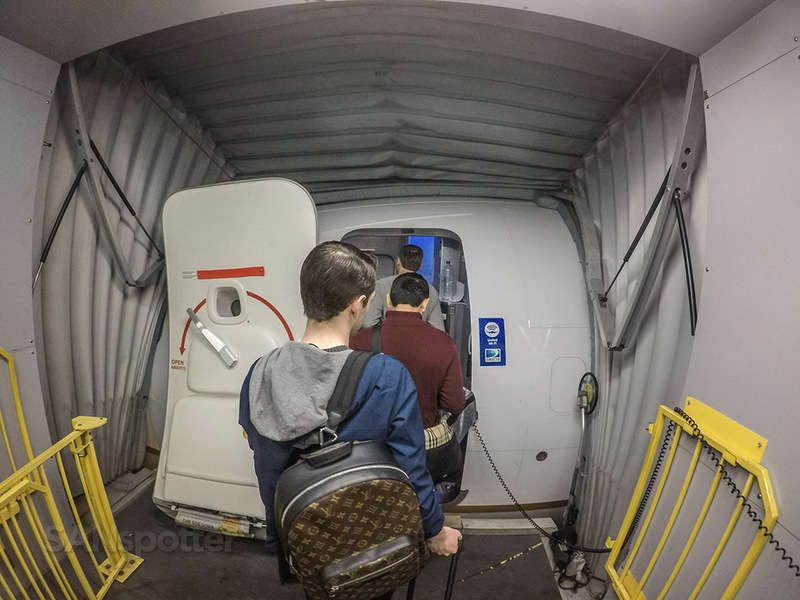 I was half tempted to slide a $10 bill under the cockpit door to see if I could get them to go early. Everyone has a price! With nothing better to do, I had fun getting all artsy-fartsy with my GoPro. 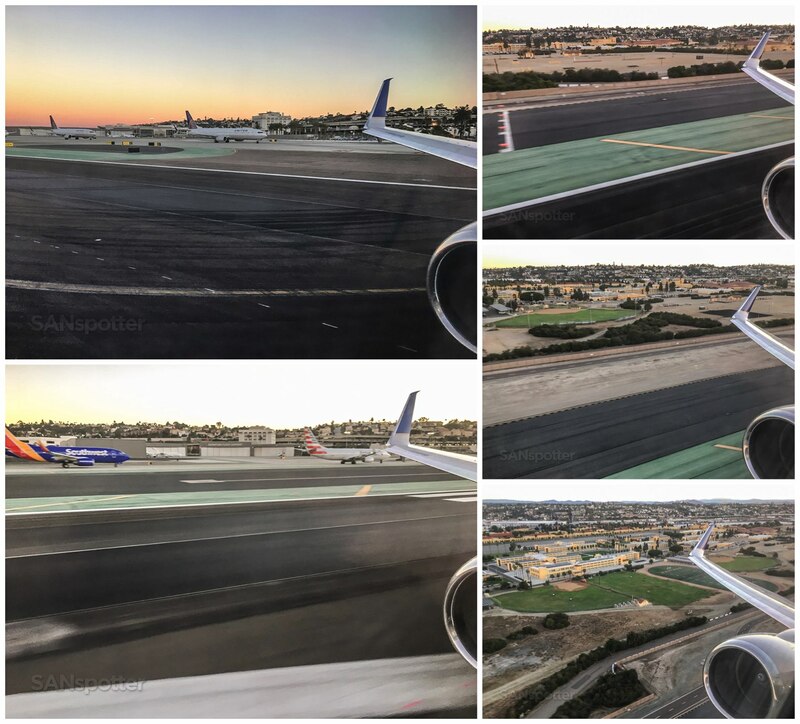 The takeoff sequence. 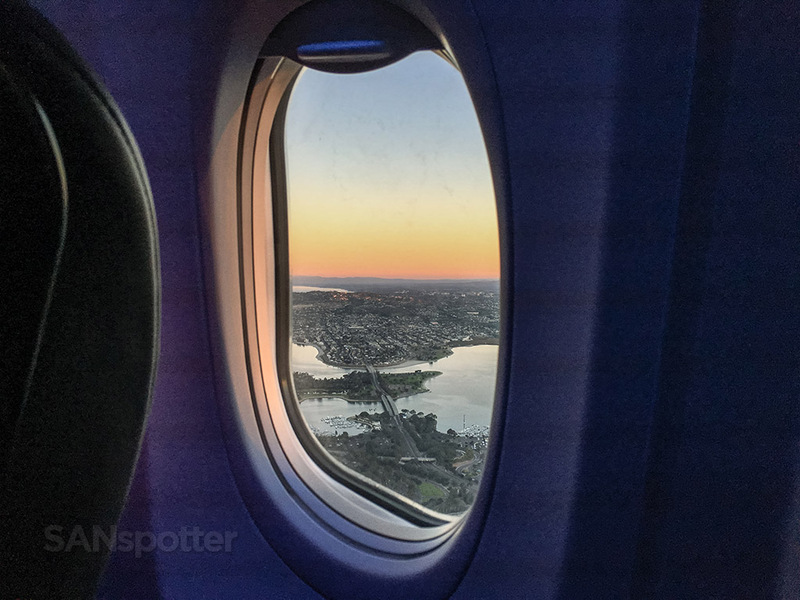 Savvy readers will know that it’s rare for me to be on this side of the aircraft on flights departing SAN – the view is usually better on the other side! 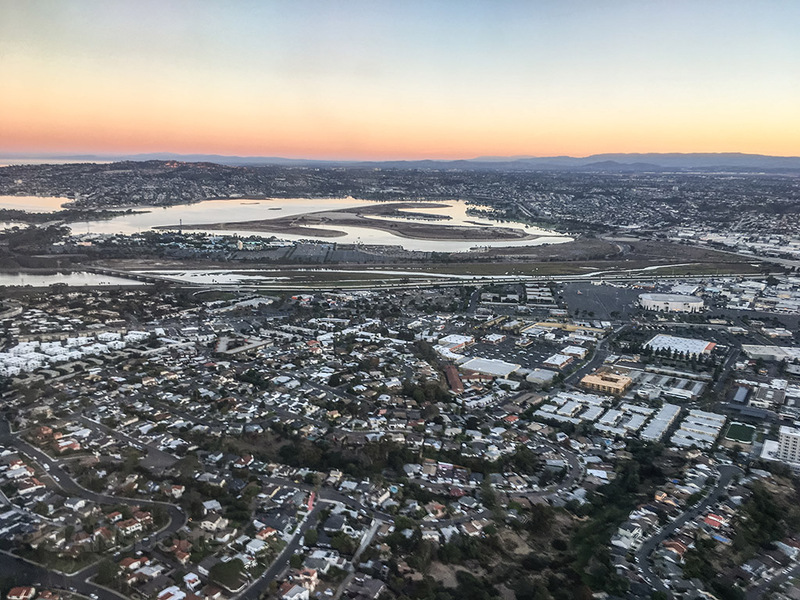 Really nice view of Mission Bay though! 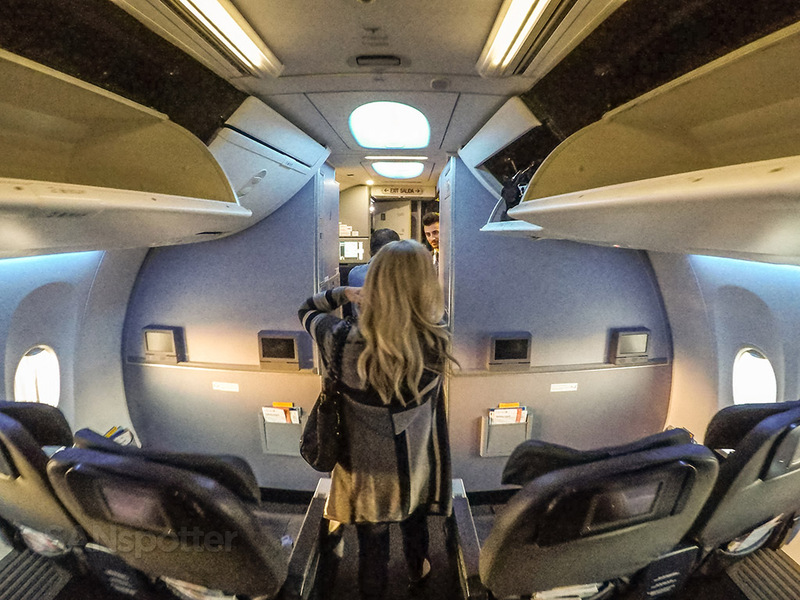 Hmmm…perhaps I need to sit on this side of the aircraft more often. Those colors! I’d be looking at nothing but ocean if I were sitting on the other side. I’m liking the view from here! Mission Bay, Pacific Beach, La Jolla, Del Mar, etc. San Diego is a great place to call home, that’s for darn sure. Sorry for all the departure pics, but there’s nothing happening in the cabin and we’ll be descending into LAX in just a few minutes. 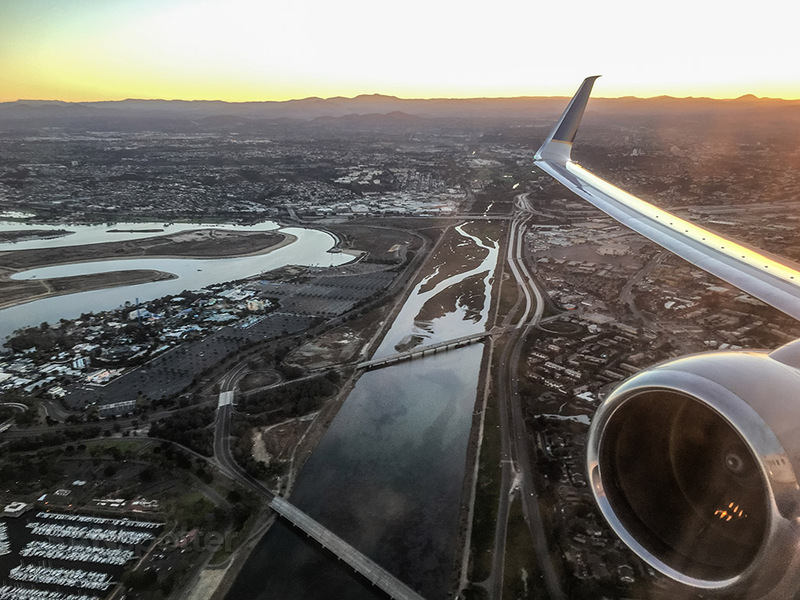 Our departure out of San Diego was totally beautiful but otherwise noneventful, and I was glued to the window anticipating arriving into LAX from the west. Cabin service was pretty decent for such a short flight, but most people up here in first class were too tired to drink anything but coffee and most didn’t even drink or snack on anything anyway. I sure didn’t need anything. Cruising altitude. All 10,000ft of it. 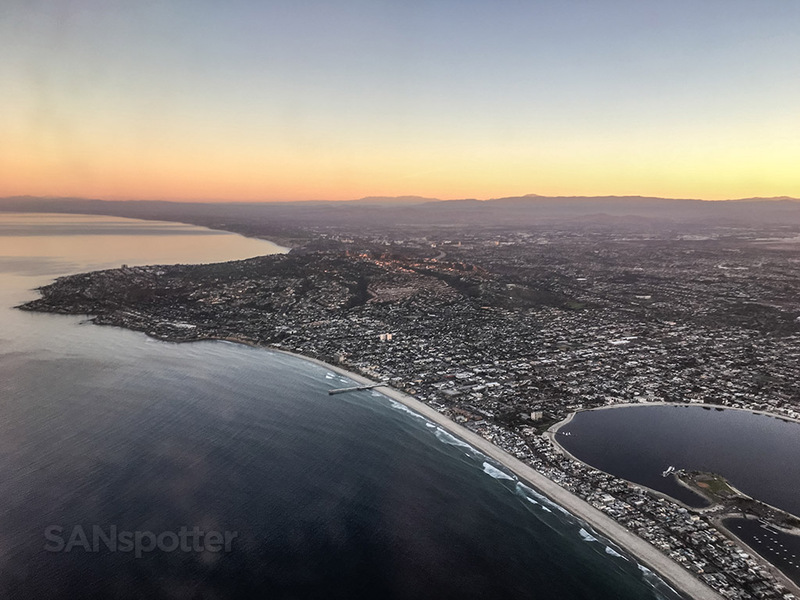 It was about the 20-minute mark that we made the unfortunate right hand turn over Long Beach, which meant that our arrival from the west had been shot to hell, and we were coming around for a runway 25L approach instead. Dammit! 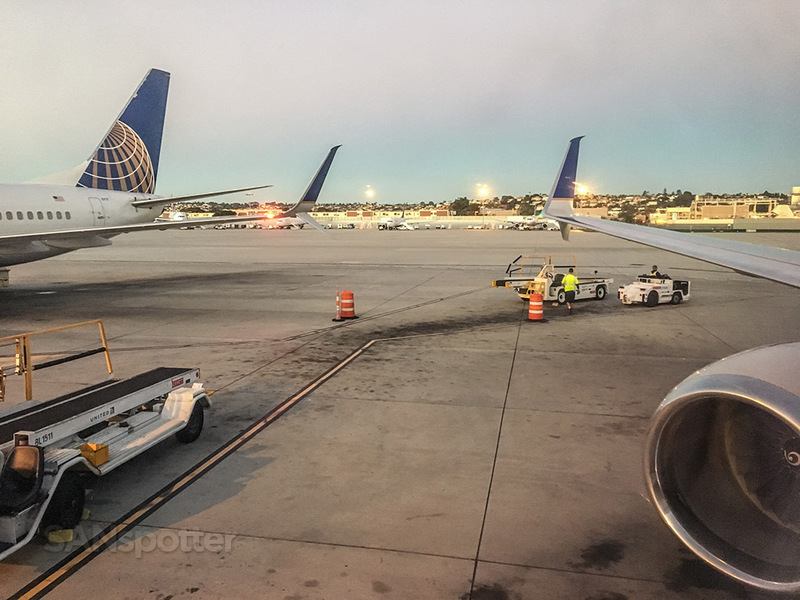 I’ve flown from San Diego to Los Angeles like a billion times already (well, 6 to be more exact but it feels like a billion lol), and I know that these SAN-LAX trip reports are starting to get repetitive. 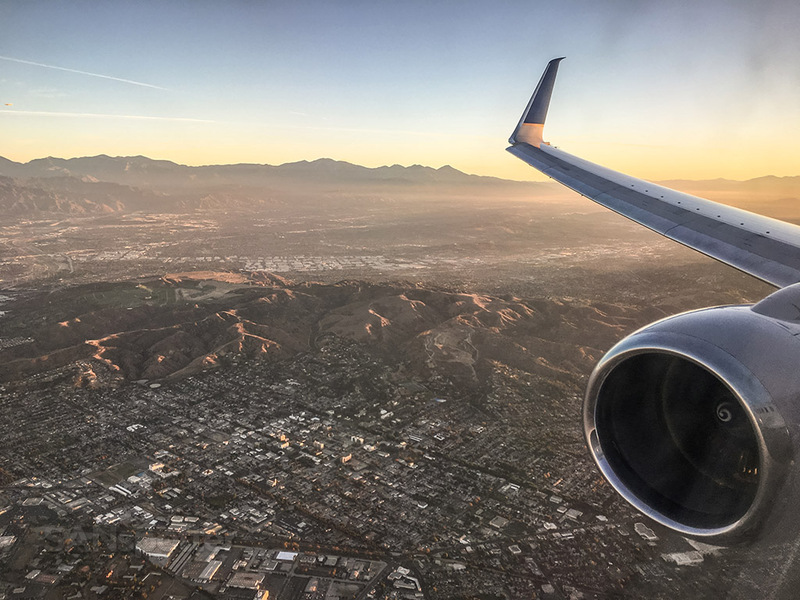 But landing in the opposite direction at LAX could have made this one a heck of a lot more interesting, and it kind of hurt to realize that this one wasn’t going to be all that special either. 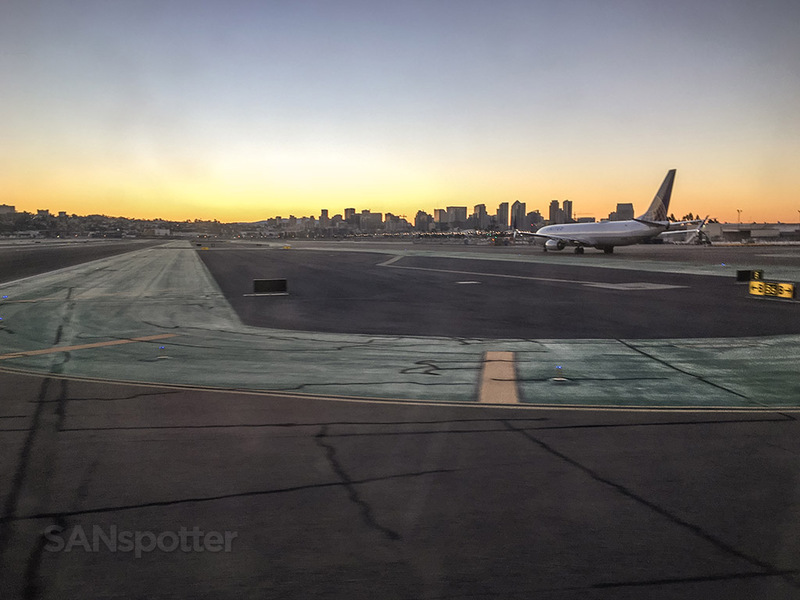 Oh well – someday I’ll get my chance to land on runway 7R at LAX. Son of a… I was hoping for a reverse-ops 7R approach instead! 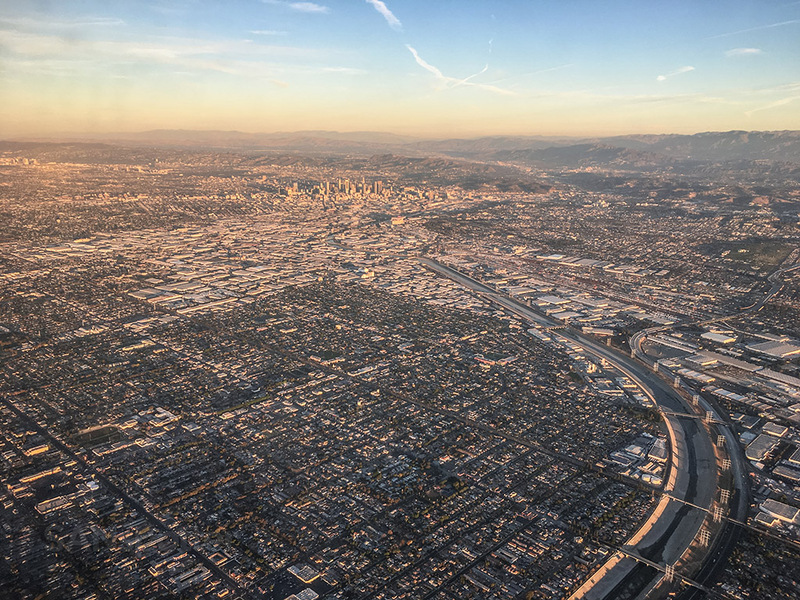 The bright side about coming in this way was getting such an awesome view of downtown LA all lit up by the sunrise. The approach and landing sequence. This would have been so much more interesting coming in from the other direction! 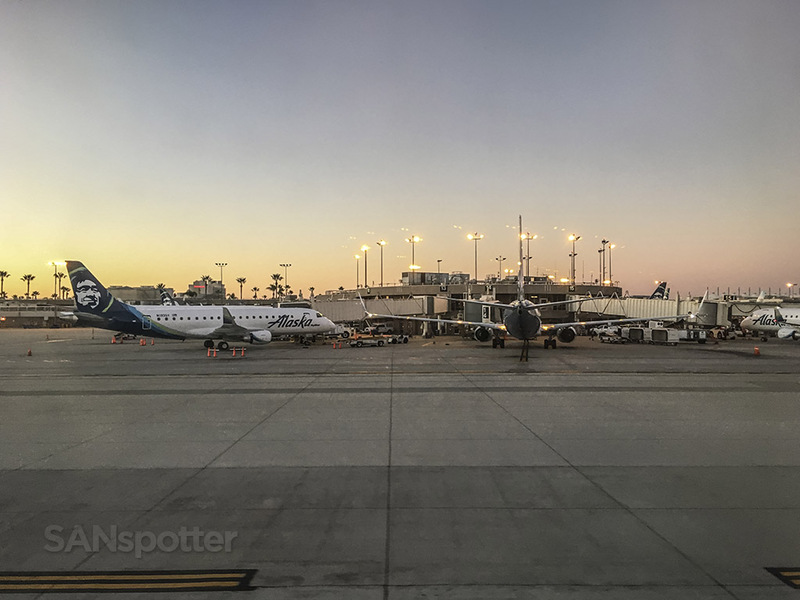 Welcome to LAX, where the local time is…much to early to be even thinking about. 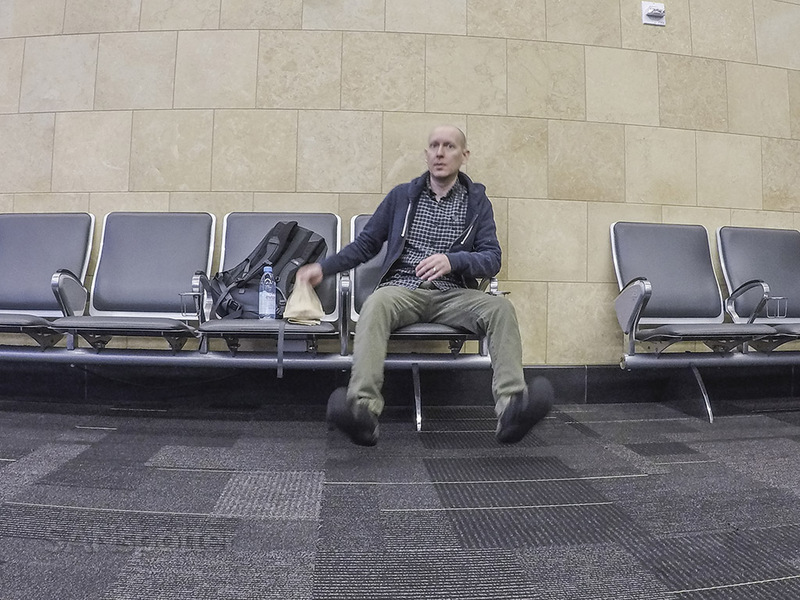 Do you ever sit and wonder where all the people on your flight are headed (and why)? I mulled that over while waiting for the boarding door to open. 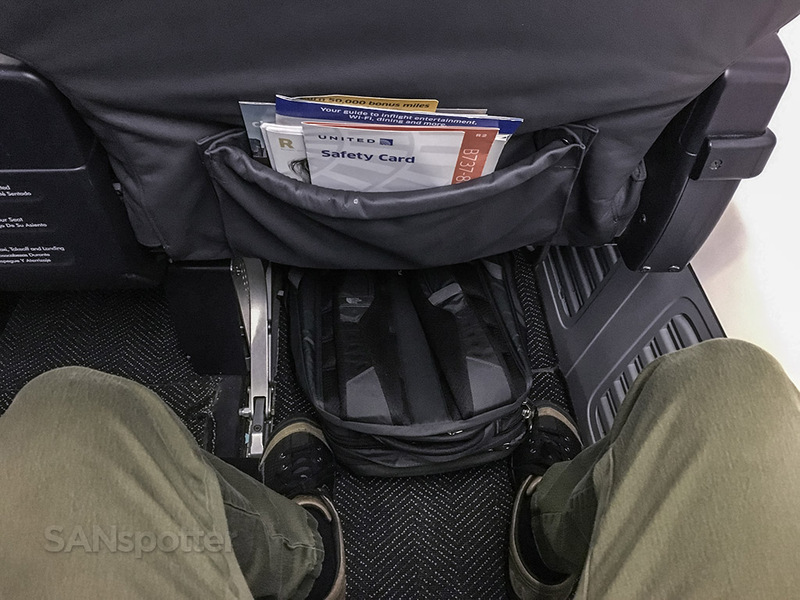 Pro tip: for the maximum leg room in United Airlines 737-900/ER first class, choose row 1! Good luck watching those tiny video screens though. Hopefully she’ll get to put her “ER” designation to good use on the next segment. San Diego to Los Angeles is hardly worthy of an “Extended Range” aircraft. 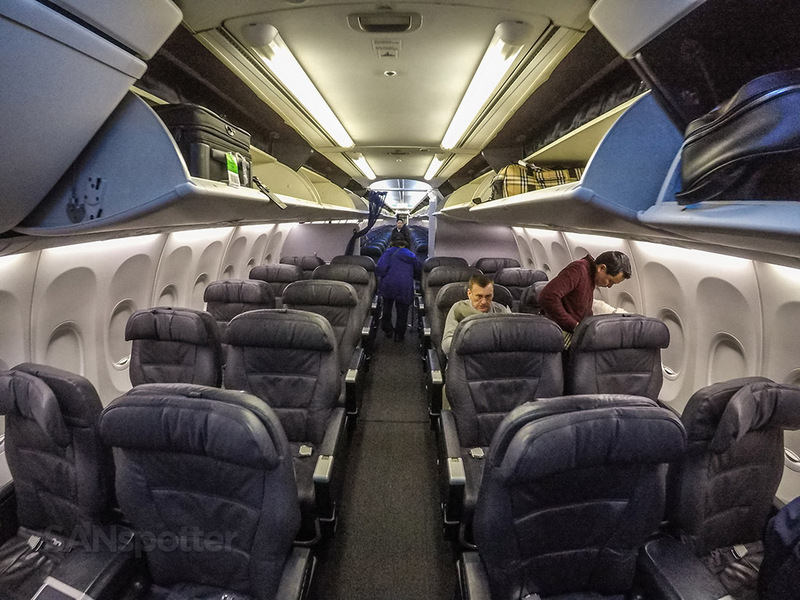 It is better than a regional jet though, so I’ll shut up before United sees this and thinks I’m complaining. After our beautifully smooth approach and touchdown, and I was actually feeling fully awake by the time I walked off the airplane. 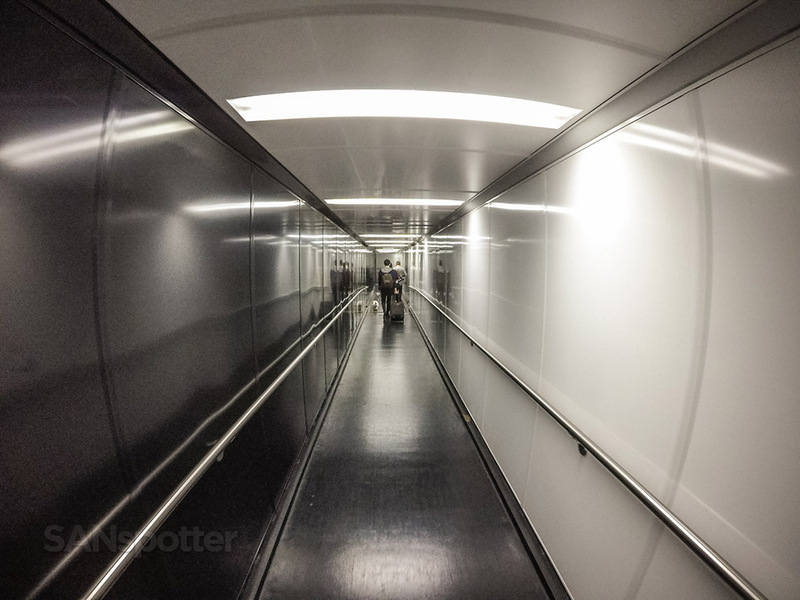 Maybe (just maybe) it was because I was secretly hoping that I would see Penelope wandering the terminal here, and that she would invite me over to whisper “it’s time to fly Scott… It’s time to fly…” right into my ear.